On the 5th of February 2018, EEIKA Brno, s.r.o. passed the recertification of quality management ISO 9001:2001. The valid certificate is available in the „Download“ section. 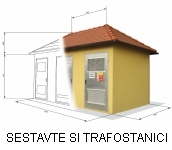 PET® kiosk substations satisfy the ČSN EN 62271-202 standard. In 2009, the passed type tests in the high power laboratory Zkratovna Zkušebnictví, a.s. in Praha-Běchovice.